Free shuttle bus to and for the location course will be available for those participants that will reserve a room or an apartment by contacting directly the hotels and agritourisms listed below. Podere Sant’Angelo, a splendid farm holiday in Tuscany, is located on the hills between Arezzo and Florence, the stunningly beautiful valley of the Casentino. Sant’Angelo is made up of three buildings, two villas (for 13 and 17 guests) and a bed&breakfast (4 double rooms). All building is nestled in a sun-beds. The garden has plenty of space for children to play and guests to relax. On the b&b there is a large wellness centre which includes a Jacuzzi, sauna, vitality pool, heated salt pool, chromotherapy shower and relax centre. The property is spread over 60 acres of fields and woods. A typical Tuscan farmhouse in a panoramic view of the castle of the Guidi of Poppi, furnished with noble materials and recovery, attention to the care of the special pieces hand made. Outside garden, with swimming pool, wellness area with Jacuzzi,opportunity of Ayurvedic treatments and relaxation with hammocks. Breakfast with local product and homemade desserts and the chance to hold tastings of organic products of the territory and high-quality wine. stones, terracotta tiles, wood and wrought iron. In a few words, the typical Tuscany farmhouse. It is the ideal place for walking, cycling and for enjoyable expedition into the nearby cities of art. Hotel – Restaurant “La Torricella” is surrounded by an area of green landscape just a stone’s throw of the national park of Casentino forest, close to Poppi, an ancient village full of history, art and culture; an ideal place for nature lover Comfort Room: situated at the first floor of main build with television, minibar, telephone and private bathroom. Superior Room: These comfortable rooms are of a high quality finish: private entrance, large private bathrooms, hairdryer, minibar, double TV flat screen, DVD player, direct dial telephone, Dolby surround, Internet access, independent heating/air-conditioning, cable radio, separate living /sleeping area. A cosy common living room with the same comforts is also available. Info & Booking: No more rooms available! The “Poggio a Poppi” was established by a careful restoration of an old stone farmhouse. It is situated in the green valley of the Casentino. Poggio a Poppi offers a splendid view over the valley. 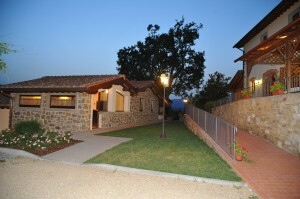 Accommodation is offered in double rooms and apartments furnished in Tuscan tradition. The rooms are spacious with private bathroom, attention to detail and are equipped with all comforts. The farmhouse has a library, restaurant, swimming pool, bike, table tennis. For Golfers there is a special discount on green fees at the Casentino Golf Course, adjacent to the hotel. Poggio a Poppi is the ideal place to spend a holiday in relax and tranquility in a friendly family atmosphere. 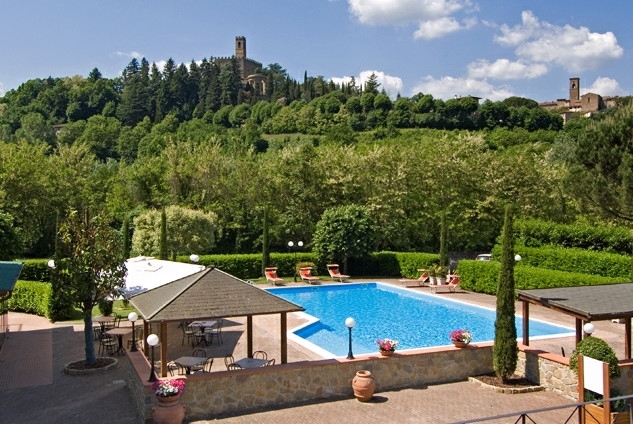 At the foot of a green hill overlooked by the ancient, magnificent castle of Poppi, lies the Parc Hotel, a peaceful 3 stars hotel where you will be received by the hospitable, thoughtful Vitellozzi family. With its rooms, a beautiful swimming pool and every modern comfort (such as TV, air conditioning and free wi-fi in every room), Parc Hotel is the best starting-point to discover all the wonders of Casentino valley. The Vitellozzi family, always ready to meet every guest’s requirements and to satisfy you with the appetizing Tuscany cooking of the hotel’s restaurant, welcomes you.